Yeah, you read that right. Seems each week, Allen Stone, the soulful preacher's kid from Chewelah that we profiled in July, keeps getting bigger and bigger. Stone's manager, BJ Olin, told Bloglander today that Stone — whose sophomore album shot to No. 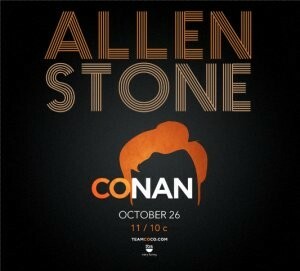 2 last week on iTunes — will make his first foray into late night TV on Oct. 26 on Conan. It's a huge step for the towheaded, very unlikely soul singer — who has come far as an independent artist without label support. "It's not that Allen hasn't been approached already," Olin said on Monday over the phone. "He has." But Olin says Stone, who recently toured with soul diva Nikka Costa, is trying to take his career as far as he can without label support. "Why would we give away the farm too early?" he says. Catch Stone for yourself tomorrow night at Whitworth, where he'll play a free show for students ($5 for the public). Stay tuned to Bloglander for more Allen Stone updates as we get them.